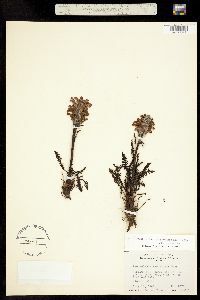 Locality: United States, Colorado, Boulder, Bog at lower end of Long Lake, 1 mi. w. of Brainerd Lake. Occurrence Remarks: Pedicularis sudetica L. ssp. scopulorum (Gray) Hulten, det. by W. A. Weber, 1964. Flowers pink.